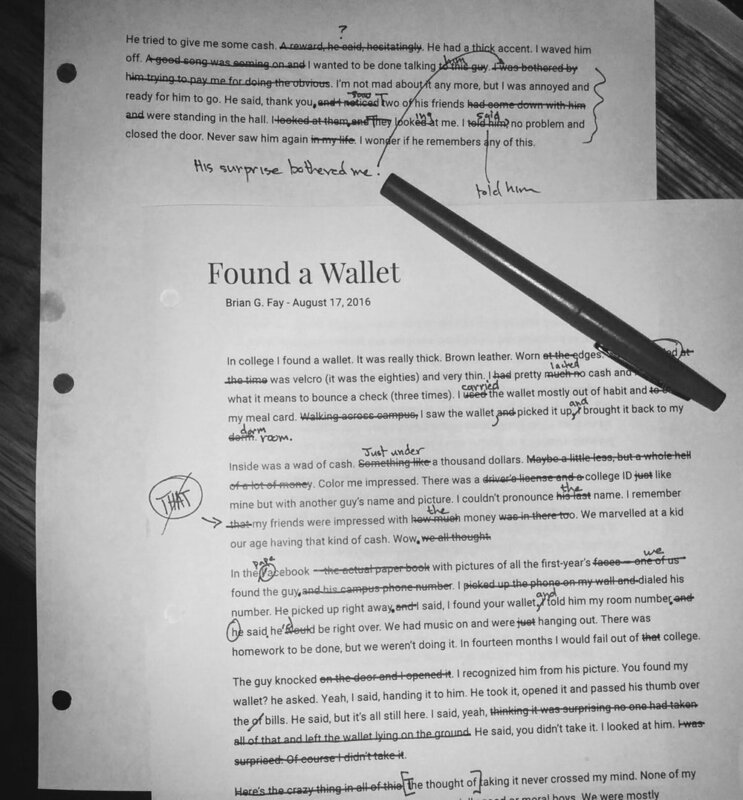 Editing my own work is often easier than working on other people's writing. A friend had an important piece of writing to do about his photography. He had drafted it, editing as he goes, a process he describes as difficult if not torturous. With it finished as much as he could, he asked me to have a look. We've known each other long enough to not worry about feelings, and so I dug in. Right away I could hear where he was going and I had a few things to suggest, mostly sentence tweaks, words to cut, and other small revisions. The piece was good but I was able to help him make it better and the process got me thinking about how seldom I involve others in my writing. I wondered if that needs to change. He does almost all his photography alone. He likes solitude in nature when he takes his shots and process them on the computer by himself. The work goes out for publication, exposure, and, if the winds are right, a living wage. Writing isn't his usual thing, though he's a strong, clear writer and that helps elevate him out of the ordinary. Writing is a way of organizing and elevating thinking. The person who can write has at hand a habit of structuring thoughts so as to do greater things with them. Most every creative person I know is adept with words. There are reasons for that. I can take a passable photograph but need to learn the basics of phone photography. I don't need expensive equipment to take shots for my blog, but learning the basics of design, composition, and lighting would help position me to do things I want to do. I imagine asking my friend for help with that but not with my writing. There are very few people to whom I would send my writing and I wonder why. Is it fear? I don't think so. I'm happy enough with my writing to put it out into the world. I just feel like the work I'm doing now is stuff I can and should do on my own. This, of course, is foolishness. Not utter and complete, but a good dose of the stuff. These blog essays I can probably pull off by myself. As I try to move into more challenging writing, I'm going to need guides. My friend has studied past masters and continues to study the work of contemporary photographers. He follows what they do, listens to their thinking, and allows all that to influence him while remaining true to himself. I've been studying writing for a very long time. It wasn't a formal study until college, but even as far back as elementary school I've been trying to pay attention. Twenty three years of teaching writing while doing my own writing, I've picked up a few things. I continue to practice writing and study it by reading with the mind of a writer. It's what I want to do. As I go forward, I'll need help and have to ask for it. That's going to be a challenge since I got into writing to be by myself. I'll get over that though. I'm in a small writing group and have felt the effects of being pushed in that way. It's not as frightening as I might have thought and this idea that writing has to be done completely alone is just wrong. I can get to the next levels with a little help from my friends. Those next levels may or may not have to do with publishing. I don't write for fame and fortune (though I wouldn't say no to either). If those were the goals, everything I've done so far has been failure. That's simply not the case. I have other reasons to keep striving and they are enough that I'm willing to risk asking for help.